It includes an agreement with aircraft manufacturer - Airbus - to set up an aerospace and defence cluster at Dholera that will initially manufacture helicopters. A phenomenal 24,000 MoUs (Memorandum of Understanding) have been signed on the second day of the 8th edition of the Vibrant Gujarat Global Summit. It includes an agreement with aircraft manufacturer – Airbus – to set up an aerospace and defence cluster at Dholera that will initially manufacture helicopters. “Till now 24,383 MoUs have been inked and we are still calculating the worth of these MoUs,” said PK Taneja, Additional Chief Secretary, Industries and Mines Department said Wednesday evening. As far as the sheer number of MoUs is concerned, those signed on Wednesday is more than the 21,000-odd MoUs (worth Rs 25 lakh crore) that were signed in the 7th edition of the summit. “France-based Airbus has signed an MoU to set up an aerospace and defence park at Dholera,” Taneja added. Deputy Chief Minister Nitin Patel later elaborated that this park will initially manufacture helicopters. Airbus currently manufactures a wide range of civil and military helicopters. Taishan Fiberglass Inc, the second largest fiberglass producer in China, signed a Rs 1,700 crore MoU to set up a state-of-the-art manufacturing plant of fiberglass in Gujarat, which will be their first overseas plant. Chinese manufacturer Tsinghshan Group has signed a Rs 5,500 crore MoU for setting up a stainless steel unit. Similarly, the Japanese have expressed interest in creating a separate cluster specially for Japanese companies. “MRF Group will be investing Rs 4500 crore and has signed an MoU with GIDC,” said Taneja. MRF greenfield manufacturing plant in Gujarat that will produce 10 lakh tyres per month. Russian companies have inked MoUs with Essar and RIL operated refineries in Jamnagar. MoUs were signed between Reliance Sibur Elastomers Pvt Ltd (a JV of RIL and Sibur Holding, Russia) and state-government arm iNDEXTb to establish a Halo Butyl Rubber Project at Jamnagar with proposed investment of Rs 1200 crore. Agreements worth Rs 23000 crore were signed between different cement companies to set up clinkering units, cement plntas and soda-ash plants in Gujarat. Six MoUs worth Rs 7020 crore were signed by GNFC with different entities. This includes agreements between GNFC and M/s Alfanar Energy, Saudi Arabia for 40 MW solar plant, Connect Power, Saudi Arabia for solar PV module plant and LED lighting plant, China’s Connel Chemical for Methylene Diphenyl Di-isocynate plant and Beligum’s Ecophos for Di Calcium phosphate plant among others. In the dairy sector, MoUs worth Rs 800 crore were signed, which includes new dairy plants by Gandhinagar and Banaskantha District Cooperative Milk Producers Union Ltd. Similarly, Sabarkantha District Cooperative has signed Rs 360 crore MoU for setting up a powder plant and a milk processing plant. “There are over 50 MoUs that are worth Rs 4000 crore and more. 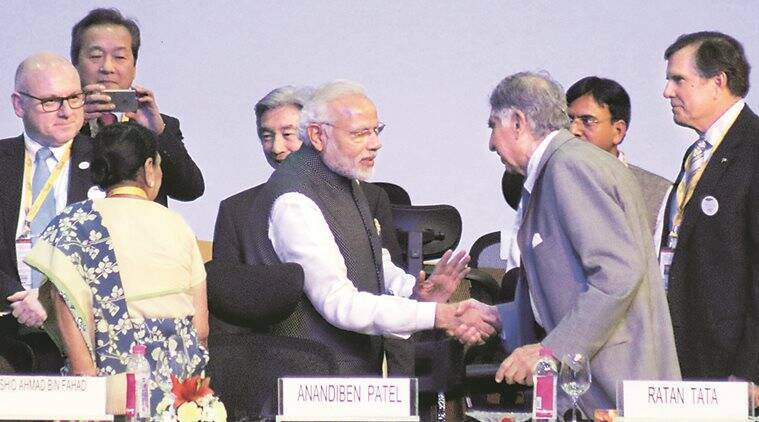 About 133 MoUs have investments worth Rs 1000-4000 crore,” said Patel who said that Gujarat Chief minister Vijay Rupani held about 41 one-on-one meetings on Wednesday. About 200 B2B and 120 B2G meetings were also held at the summit venue. The Urban Development department has signed 1400 MoUs, while the finance sector accounted for Rs 66,600 crore of MoUs. The agriculture and animal husbandry department also signed over 4000 MoUs.